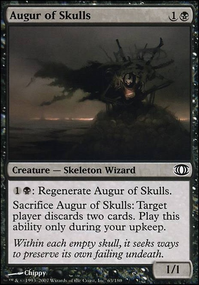 Afterlife is a really good removal for white so you might want to add it, Angelic Purge too. Battle Screech , Captain's Call give you more of a swarm strategy without costing too much, i would add screech to the main. Emerge Unscathed gets you 2 triggers costing only 1cc and protection, Test of Faith is a neat combat trick for killing pretty much any early creature and giving you a neat early clock as well as triggering and saving your cmdr, Dawn Charm , Benevolent Bodyguard , Standard Bearer give you protection to every creature and Palace Sentinels gives you a bit much needed card draw in white. So as a fellow player of Renegade Freighter I'm happy to call this one of the coolest new takes on the idea for vehicles. The exalted really helps push damage through and you seem pretty capable of being a real threat even without vehicles. Mobile Garrison is also intersting as it help defend, but I feel as though it could be a dead card if you already have a Frieghter out and attacking, but whether you agree or not with that is fine. 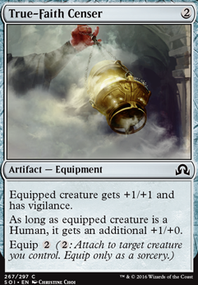 Mana Leak is a good card, but if your using three colours you'll probably want to use as efficent spells as possible such as Dispell; and Vapor Snag is also a good way to stop irritating creatures and is a favorite of mine but Mana leak is still good so keep it if you like it. But mana efficency is also why I reccomend Apostle's Blessing as it can cast with any colour; and as a side note Benevolent Bodyguard can crew vehicles which is relevent, which is also applicable to my recomendation for Kami of False Hope. I know this may seem like a lot of stuff to reccomend but I love your deck concept and I'd love to see it improve! Cheers and have fun out there! I'd run 4x Zulaport Cutthroat and 4x Grim Haruspex. 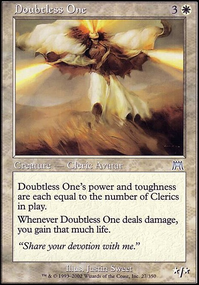 Merciless Executioner pairs really well with Dictate of Erebos type effects, so might be worth running more of. Phantom General probably isn't worth running. Kheru Bloodsucker isn't very good, you don't have many things to trigger it. Geist-Honored Monk is okay, but doesn't really fit into what you're trying to do. Doomed Dissenter is okay as sacrifice fodder, but that's all he does. Not a huge fan of the instant / sorcery spells except for Bone Splinters. 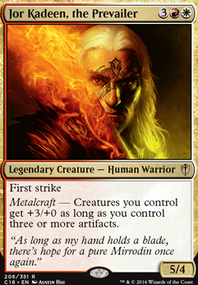 Children of Korlis is a cool human that can sac itself ot trigger Xathrid and its effect negates damage for a turn. 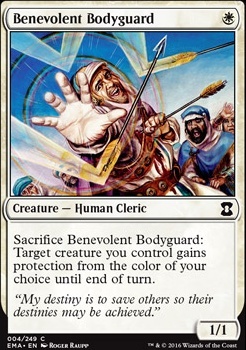 Benevolent Bodyguard can be sac'd to save one of your important guys from removal, like Xathrid; and he's also a human to trigger the effect. Lifelink seems like a weak option here; you're aggressive enough to where you don't really need the buffer, and Seeker of the Way already has it if you're desperate enough. I STRONGLY recommend a couple Standard Bearers in the side or even the main. Enchantment stacking is just asking to get you crushed by spot removal, and while stacking protection is nice, it's not a long-term solution, especially if your opponent is heavily control. Speaking of protection, a couple Sejiri Steppe instead of Plains would be great for utility. Wingsteed Rider is probably worth consideration. Maybe in place of a Benevolent Bodyguard and a Mutagenic Growth. In a deck like this, I'd worry about running out of gas, so I think you could stand to add a couple Pentarch Wards to cantrip/replace. Always cool to see another heroes build! 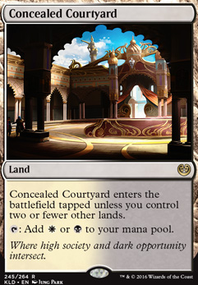 If I may suggest though, I find that Benevolent Bodyguard tends to be worse than something like, say, Emerge Unscathed as while it does require keeping a mana open it can take the opponent by surprise (and in this case can create another heroic trigger next turn). I generally find playing the effect at instant speed works better, but I can also see the benefit of another body, so I guess it's all about preference.